A young and ambitious writer named Jerome David Salinger set his goals very high very early in his career. He almost desperately wished to publish his early stories in The New Yorker magazine, the pinnacle, he felt, of America’s literary world. But such was not to be for several long years and the length of one long world war. The New Yorker, whose tastes in literary matters were and remain notoriously prim and fickle, was not quite ready for this brash and over-confident newcomer with the cynical worldview and his habit of slangy dialogue. But other magazines were quick to recognize a new talent, a fresh voice at a time when the world verged on madness. Story magazine, an esteemed and influential small circulation journal devoted exclusively to the art of the short story and still active and respected today, was the first publication to publish the name J.D. Salinger and the story “The Young Folks” in 1940, an impressive view of New York’s cocktail society and two young people talking past one another, their conversation almost completely meaningless and empty. His next short story was published in a college journal, The University of Kansas City Review. “Go See Eddie” is a tale of quiet menace, as an unsavory male character gradually turns up the pressure on a young lady to see a man named Eddie. Also published in 1940, the story is notable for the backstory that is omitted — a technique that Hemingway used to great effect. Four years later toward the end of Salinger’s war experience saw the publication of “Once A Week Won’t Kill You,” again in Story magazine. Ostensibly about a newly minted soldier trying to tell an aging aunt he is going off to war, some may see the story as a metaphor for preparing one’s family for the possibility of wartime death. This anthology of Salinger’s early works includes original illustrations by Anna Rose Yoken, a talented young artist based in Los Angeles. Our scholastic edition of Three Early Stories was released in October 2015. Three Early Stories gives invaluable insight into the early stages of a legendary writer and is a fantastic addition to upper level high school and collegiate English classes. ​The scholastic edition of the collection assists both classroom and independent study with its comprehensive endnotes, discussion questions, writing prompts, and a Salinger timeline compiled by University of Memphis English professor and author Michael Compton. 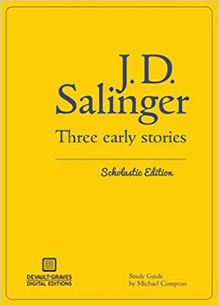 "Salinger Goes Digital (Legitimately) Thanks to Devault-Graves"
"Indie Publisher Releases First Salinger E-book"
"Old J.D. Salinger Stories Revived by New Illustrations"
"3 More J.D. Salinger Stories Published"
"J.D. 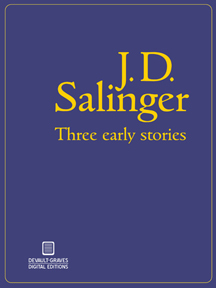 Salinger Probably Isn't Happy About the Release of New Book Three Early Stories"
"J.D. Salinger Stories Published After 70 Years Out of Print"